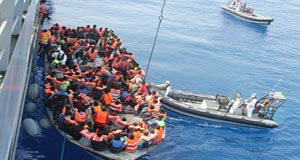 In the 9 September edition of Mercy eNews (Issue #638), we reported that MIA is one of 14 NGOs in Ireland calling on the Irish government to take immediate steps to respond to the displaced persons of Northern Africa and the Middle East. MIA has now been invited to meet Mr. Brian Hayes, a member of the European Parliament on Friday 9th October. He has been appointed to the Development Committee of the European Parliament, as the only Irish member. This committee deals with the Union’s humanitarian aid and relief programmes. He is interested in hearing our views in relation to the European Union’s response to the refugee and migrant crisis in the Mediterranean and across Europe. He has invited us to name what we see as the top priority and to outline the issues we would like him to address on our behalf.